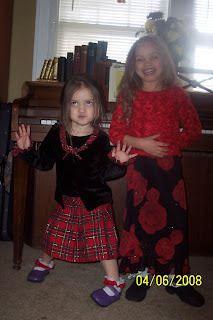 I was surprised this morning to find that the girls had already dressed themselves for church of their own accord! Karissa is incredibly picky about her clothes. She had replaced the socks and shoes I had laid out for her own choices - including some not-so-great socks and her favorite purple shoes! Isn't she Kooky? Notice the streaker who kept messing up our attempt at modest picture-taking. 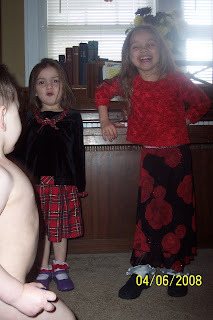 The kids love their new outfits from Grandma Fry. She took the picture and took the kids to church for me since I'm still home sick. Here are my sweet darlings. So cute. Your kiddos gave me a good laugh this afternoon. Adorable kids, Sarah. I'm sorry you aren't feeling well. So glad you were feeling well enough to be there Sunday night. I'm sorry you were sick and Tony was sooo bummed about missing chimichangas (or something of the like). 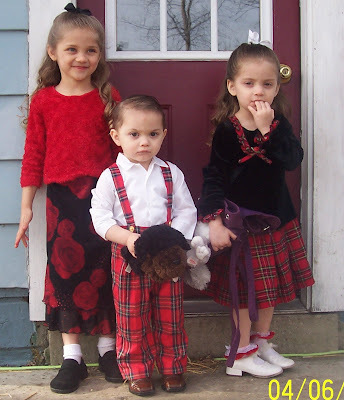 Your kiddos are so cute and Kayla is looking like a beautiful young lady in that last picture - Daddy better get prepared for all them boys who'll come knocking! It'll be here before you blink! I love those first pictures of Kayla laughing. Reminds me of how you and Deanna always love a good laugh! Hmmm, better keep our little streakers away from each other or they might band together to start a nudist church! "-) Your kids are adorable. Just adorable. Miss you guys. Maybe there should be a warning in baby name books by the name Karissa!! Kooky fits well.... My Karissa's favorite shoes are hot pink and VERY well worn.